Local future guides in Panama with Annie Young J.
HRB: What do ecotourism stand for? AYJ: Well there are so many different academic definitions…Ecotourism is a form of nature-base tourism. But the one that I like refers to the concept that ecotourism is responsible travel to natural areas that conserves the environment and sustains the well being of our local communities. Ecotourism is environmentally responsible travel and visitation to relatively undisturbed natural areas in order to enjoy and appreciate nature and also cultural features from the past and the present. It is also a form of tourism that promotes conservation, has low negative impact from visitors and provides economic benefits to locals. HRB: Where do it come from? AYJ: Ecotourism is a sub-component of the field of sustainable tourism. If you want to know a bit more of sustainable tourism in Panama, I invite you to learn from our Association: www.aptso.org (Asociación Panameña de Turismo Sostenible). Ecotourism is connected to the conservation movement. It provided a highly source of revenue to natural areas that need protection. I worked as a volunteer in the some local NGOs when I was younger and it was a good dynamic: conservation plays an important role in the promotion of ecotourism and both can work together. Some good resources: The Sustainable Travel International and the Ecotourism Society. Both organizations offer important guidelines to the private sector that promotes ecotourism. HRB: When did Panama start ecotourism? ACY: I started learning about ecotourism in Panama in the early 90s when the conservation movement started growing here. I had the opportunity to be a volunteer for ANCON, a local NGO that promotes conservation of land and also worked for The Panama Audubon Society, that promotes conservation for bird’s habitats. These two experiences give me an important insight on how the conservation could be linked to the outdoor travel. As volunteers we visited different areas in Panama to promote conservation and environmental education. We did field trips with donors to see bird’s habitats to National Parks, private reserves, indigenous communities, and this was my first experience as an ecotourist. Ecotourism is a niche market that is growing… sadly not so rapidly in Panama. Some countries, some companies and some destinations have developed ecotourism policies and we should learn from those experiences. We need to create policies in Panama for sustainable tourism. We are on the race but a little behind. Costa Rica, Brazil, Chile and USA are interesting examples and we can learn from the good experiences. HRB: What kind of people travel like this? and why should we? ACY: I feel that people today want to travel responsible and also want to receive guidance. The ecotourists wants to behave responsible when travel: how can negative impacts be minimized while visiting sensitive environments and cultures? How can we interact with local cultures without affecting them? How can we contribute to the conservation of the visited areas? People and travelers that are sensitive to these issues are the ecotravelers. And to me those travelers are very important because they will demand sustainable services and with this demand good offer will arise and more conscious companies. Ecotourism can be a highly effective tool for conservation, but it depends on committed tour operators, service providers that also want to work for the future generations. HRB: Is the ecotourism growing? Or can it be only a trend? ACY: It will keep growing if we have travelers behaving in a responsible way and committed with the principles of sustainable tourism. It will keep growing if more companies embrace a responsible approach in tourism and work not just for today. Sustainable travel and ecotourism are the only way of traveling in our current world. If we want to keep it for the future generations, this is the best way! Annie Young J. founded EcoCircuitos Panama in 1999. She is in charge of the Marketing and Sales Department and continually researches and creates new programs and adventures. Annie has a degree in Social Communication with an emphasis in Journalism from the University of Panama, a diploma in Business Strategies for Environmental Sustainability from Stanford University in California and a Course on Environmental Management of International Tourism Development from Harvard University. She is the President of APTSO (Panamanian Association of Sustainable Tourism) and is committed to the conservation and social development of Panama through the promotion of sustainable tourism. Based in Panama City, EcoCircuitos Panama was found in 1999 as a sustainable oriented tour operator that specializes in personal travel planning for small groups, individuals, families and couples throughout the Republic of Panama. Offering custom-made travel packages we are recognized as a pioneer in Panama in the green tourism industry for the high quality of our services and our commitment with the environment, conservation and locals communities of Panama. 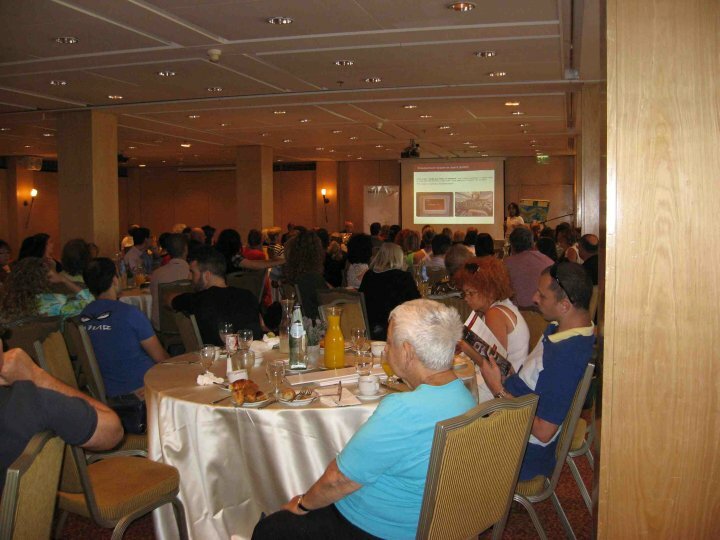 Recently we conduct a series of seminars and workshops for travel agents. We have more than 200 participants and most important, we are sure that this private effort will bring more clients to Panama and our partners! We are committed to fulfill the expectations of our clients and we guarantee an unforgettable experience in Panama!